Have you ever wanted to see into the future? Gain clarity into a problem or situation? Are you looking for ways enhance your spiritual practice? Have you wondered who your spirit guides are and what messages they may have for you? Hi! I’m Stacey B., creatrix of TarotPugs. I’m a psychic (clairaudient / claircognizant / clairvoyant) who reads tarot to look into the past, present, future and even the spirit realm. I began my interest in tarot and the occult in 1997, but after a long hiatus away from my practice, I returned again to it. My readings are guided by my spirit guides and yours to help bring messages to answer your question and provide information that is needed most at that time. Tarot offers guidance similar to a road map that can lead you through hazards and bumpy roads along the way and can help you get to where you want to be. In 2016, TarotPugs began contributions to Under My Wing Pug Rescue (UMWPR) in Ottawa, Ontario, Canada. 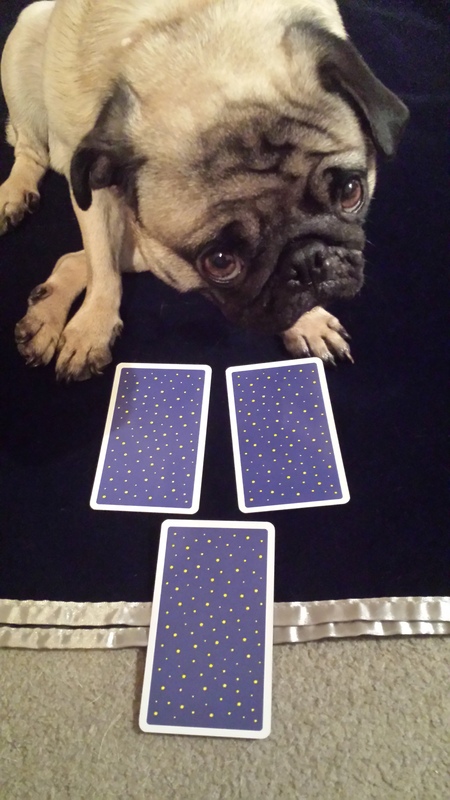 A portion of all tarot readings is donated to UMWPR to help rescued pugs and provide funds for medical treatment, rehabilitation, food, toys and foster care. If you’d like to work with me and see what readings are available, please visit the TarotPugs Shop for more info. Tarot images that may appear on TarotPugs.com are from: The Starchild Tarot Akashic Edition (©2016) by Danielle Noel (Starchild Tarot); The Wild Unknown Tarot (©2016) by Kim Krans (HarperElixir) (The Wild Unknown); Radiant Rider Waite (©2003), Rider Waite Tarot (©1971), Tarot of the Cat People (©1984, 2004) and Russian Tarot of St. Petersburg (©1992) all used with permission of U.S. Games Systems, Inc., Stamford, CT 06902; and Fairy Tarot by Doreen Virtue and Radleigh Valentine. All rights reserved. Oracle decks that may appear on TarotPugs.com are from: Les Vampires by Lucy Cavendish; Indigo Angel, Healing with the Angels, Angel Therapy, Magical Messages from the Fairies, Healing with the Fairies all by Doreen Virtue. Oracle of Oddities (Charity Edition ©2017), Arcana of Astrology (©2016), Compendium of Constellations (©2017) by Black & the Moon. All rights reserved. Images for this website designed in Canva. Great intro you have here :-). One of my dogs is a pug mix – she doesn’t have the nose or the great wrinkles (unless you rub in just the right spot behind the ears) and she’s a bit bigger than a typical pug, but she definitely has the ears, eyes, puggy-body and curlicue tail. Adorable and smart! Gotta love ’em! Also I’m a fan of crystals and tarot, so it looks like we have similar interests. I’m in the middle of working up a crafting blog to complement my thinking blog (some different kinds of readership) and will be putting info on crystals there when I finish getting it organized…. Would be great to collaborate on some of it. Do you have fave authors or resources? Or do you do your own assessments on crystals’ properties? Or both? Good luck on your blog and blessings to you and yours! I use those resources too! Judy Hall’s “Bibles” are awesome resources. I always found it interesting that you don’t need to know or believe anything about how stones work. They do their thing anyway. So glad to have found your site via hocuspocus13. Love tarot and pugs. I have a food blog http://apuginthekitchen.com. I have a pug 14 yrs, Nando and my other pug Izzy passed in October. She was my heart. I look forward to more posts from you and your two sweet pugs are wonderful.So is the cute kitty!